Think outside the work space and be the hit of your club. 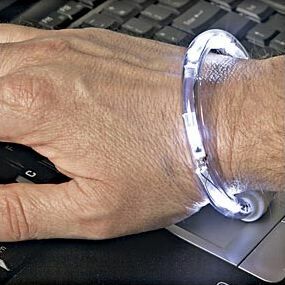 Wrist Light lets you work hands-free when you work and play in dark areas. Just place the clear bracelet on your wrist, snap lock on and push the on/off switch to turn on the 4 LED lights within the bracelet. Stop struggling with holding a flashlight under your chin when working on electrical, plumbing, computer or automotive projects. Perfect for night life, raves and parties too. Replaceable button cell batteries included. 3-1/4" diameter fits most wrists.